To pay using SnapScan, select SnapScan Payment when you checkout. 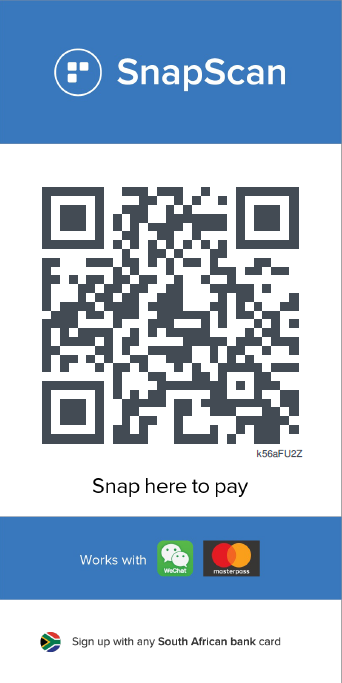 After checkout is completed, and you have confirmed that your order is correct, you can return here and scan this SnapScan code to pay. Please reply to your order email letting us know that you have paid by SnapScan so we can easily match your payment to your order. Welcome to the GoSA Online Store, where you were able to purchase Geocoins and Merchandise from pertaining to the 4 Mega Events held in South Africa. The front of the coin depicts the Mega Logo and indicates the location in Johannesburg South Afric..